Director Tim Sullivan has appeared on a season of the VH-1 reality show Scream Queens and made wacky, sexually explicit, gory, campy horror films like 2001 Maniacs, 2001 Maniacs: Field of Screams, and the “I Was a Teenage Werebear” segment of Chillerama. With his movie Driftwood…he does none of that. It’s interesting that I decided to watch Driftwood, because just yesterday, I saw a trailer on the internet for a documentary called Kidnapped for Christ, about teenagers whose parents signed them away to an Evangelical Christian reform school—where the kids claim to have been psychologically and physically abused. Amazingly, in this 2006 film, Tim Sullivan creates a fictional, supernatural tale that incorporates details of the very abuse claims exposed in the documentary. The first half focuses on the terrifying circumstances this practice puts young, confused, abandoned teens in—and the abuses they face at the hands of the sadistic people running the show. Once I knew what the movie was about, I was tensed for some horrible scenes, but the movie noticeable underplays it. And by the last half-hour, the ghost story takes full effect. This is a tame experience that ends up feeling like your standard teen chiller once the dark, tragic message has been delivered. 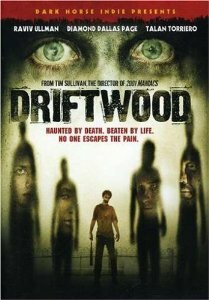 Driftwood will probably disappoint those looking for a horror movie, but hopefully, by injecting a “based on a true story” angle with a supernatural tale, it might actually get some viewers to pay attention to the very real horrors of these evangelic reform schools. This is the type of disturbing reality that makes me wonder how people of faith can look at themselves in the mirror after turning their children over; how those who claim to be all about protecting our children can reject their own children and send them to evil places that destroy their fragile minds further; how those worried about their children being exposed to an immoral world do not take aggressive steps to banish these types of hellish places; how major self-righteous religions blatantly ignore the fact that other massively powerful religions have covered up atrocities against children for…EVER. Dear GOD it feels like I just wrote a PSA…. This entry was posted in Movie Times & Television Schedules - Staying Entertained, The Evil of the Thriller - Everything Horror and tagged Driftwood, ghosts, supernatural. Bookmark the permalink.